There is nothing more memorable for your students than having live wild animals visit your classroom! Your group will have the opportunity to meet three of WildCare’s rescued non-releasable wild animals during this unforgettable presentation. By sharing their rescue stories, these animals act as ambassadors for their species in order to increase awareness of their plight in the wild. 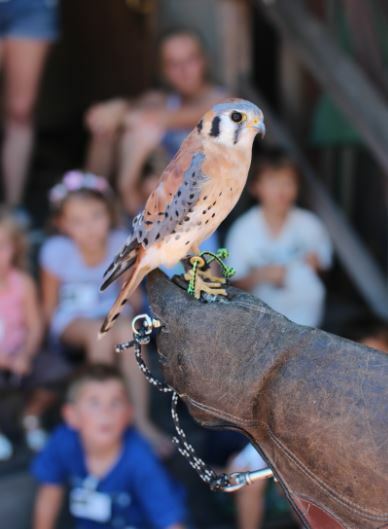 Possible wildlife visitors include a Northern Spotted Owl, Virginia Opossum, squirrel, California Desert Tortoise, Gopher Snake, Rosy Boa, California King Snake, American Kestrel, Red-tailed Hawk and Western Screech Owl! Whether you are looking for an overview of California Wildlife or a more specific topic to fit into your class curriculum, this program is sure to leave a lasting impression! $220 for 1st presentation, $160 for second presentation, $1 per mile travel fee ($10 minimum). 60 minute presentation, 1st grade to adult, 30 person maximum per presentation, 2 presentation maximum per day. To reserve a Wildlife Ambassador program, click here or call (415) 453-1000 x16.